Overview: Better, stronger, funnier! 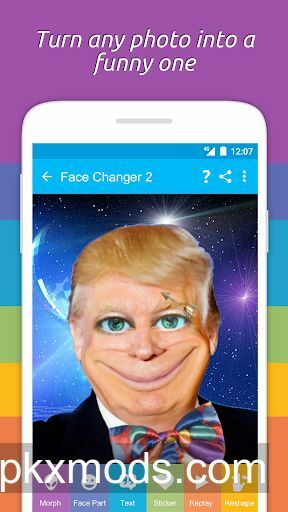 After 50M happy users, comes the new and improved Face Changer 2! Takes a selfie and start having fun! Swap faces between friends and with your favourite characters. Morph heads, add face parts, funny hats, silly glasses and hundreds of accessories, stickers, backgrounds and more. Want to laugh some more? No problem! Enter the PhotoBooth to become anyone you want! Play with fun quizzes, games, funny photos stacks and much more is coming up.